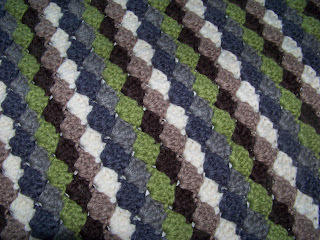 I have to finish the stripey blanket for my Dad's 60th in September. The body is done in this lovely shell stitch, but the sides still need finishing. It is a really thick and soft acrylic yarn, perfect for the cold German winters. Out of the leftovers I want to knit a green and dark blue stripey Jumper for my son. There is also the crochet Japanese flower scarf for my daughter and a crochet cardigan. So, I hope to finish the blanket in April and then start of the Japanese flowers. I usually have a one project at the time policy (I am a terrible procrastinator and whilst I love starting things I just won't finish otherwise), but the blanket is really too heavy to take with me to the various activities of my children so perhaps I will get started on the Japanese flowers this month as well.